When you have a bar table, a built-in bar or space at your kitchen counter, bar chairs are very suitable and a wonderful addition to the space. 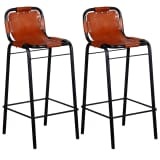 Bar stools differ from normal stools, as they are higher and usually have a backrest, which ensures comfort when you use them on a regular basis. 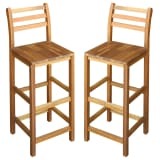 Here at vidaXL, you can find a beautiful variety of bar stools, in fresh colors, with or without back and arm rests. Brightly colored bar chairs really go well with a neutral bar table! 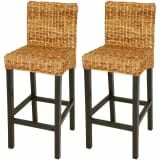 Here at vidaXL, you will find a fantastic selection of bar stools in a variety of distinctive styles. The diversity in colors and designs available, makes sure you can find the perfect bar stool for every interior. From colorful gas lift bar chairs to more classic designs, with or without back and armrests, we really do have it all! If you want to have the option of tucking your bar stools under the counter, a design with arm rests might not be the best option for you. As well as the fabulous range of colors and designs, there is stunning selection of materials to choose from, for example, beautiful fabrics, wood and faux leather. Are you always having people over for dinner, entertaining guests or throwing a party? If so, bar chairs not only look great, they are also a very convenient form of extra seating. 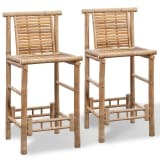 Because most of our bar stools are adjustable in height, your visitors can sit at (approximately) the same level as people who have sat on the other chairs and sofa. 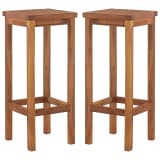 A set of bar chairs is essential when you have a bar table. 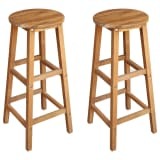 If you only need stools for your kitchen counter or a small table, you may only need to choose a single bar stool or maybe a set of two. 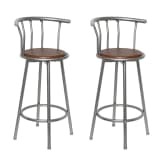 With the amazing selection of bar stools that we offer, the possibilities are endless!